Investors are grappling to understand what’s taking place in the wild semiconductor sector. The group is bouncing in a wild ride, but many investors warn the volatility could be a signal of more earnings weakness to come this year. 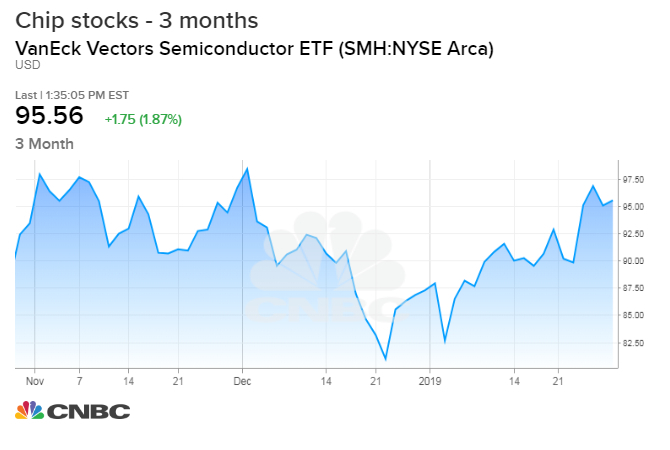 “Semiconductors are the very definition of cyclicals so they got absolutely pounded when the market rolled over in December,” said Daniel Niles, founding partner of AlphaOne Capital Partners. The VanEck Vectors Semiconductor ETF, up 1.5 percent Wednesday, is up 18 percent from its Dec. 24 low. On Dec. 24, it was down 29 percent from its 52 week high in March. AMD alone is 34 percent above its December low. The shares were down more than 50 percent from its September high. Companies “either missed the quarter, they lowered guidance or in most cases both. The majority of the stocks went up. You see this pretty frequently when investors are trying to call the bottom. With semiconductors having come down a lot over the course of the last year, it’s pretty normal. You have to ask yourself whether the earnings revisions are over. I don’t think they are,” said Niles. But that hasn’t stopped investors from jumping in. Despite AMD’s stock rally, analysts were questioning its revenue forecast, noting the guidance was very aggressive. While it expects improved margins and higher revenues for the year, it expects a slump in current first quarter revenue of $1.25 billion, a drop of 24 percent from last year. “…the controversy will now undoubtedly hinge upon the achievability of that full year guide, which requires a back-half ramp that would make Evel Knievel nervous,” wrote Bernstein analysts. Baird analysts said the AMD outlook was aggressive, and they instead expect flat revenues for the year. Some of the warnings from the sector have been macro in nature. Intel’s interim CEO, Robert Swan, told CNBC last week that a number of global concerns are leading his company to reduce its 2019 outlook. Intel stock was rising Wednesday, along with the sector though it is down 2.2 percent in the past week. NVIDIA fell hard on its lowered forecast, and is down 9.8 percent in the past week, while up 2.3 percent Wednesday. Texas Instruments, KLA-Tencor, Micron and Xilinx were all trading higher. Trade negotiators for the U.S. and China are working towards a agreement by March 1, or new tariffs would go into effect. Niles also said an earlier Chinese New Year this eyar, starting Feb. 5, has also likely pulled business activity forward, making China sales appear better than they are. Niles said he expects the demand softness to show up after Chinese New Year’s, and that could drive stocks lower.